I disappear into books. What's YOUR superpower? Transported to a different reality when reading. Need someone to watch over me until I finish the book. You know, to tell me if the house is on fire or something like that! And yes, my cat goes along with me! Been missing you. I'm back! I love this!!! So good to be in touch with you again, Karen!!! I love reading, and communing with animals, both domestic and wild (squirrels and birds). I swear the backyard squirrels are starting to understand what I am saying. The squirrels used to throw nuts at my dog. I nicely told them to cut it out. When I come into the backyard, I tell them, the dog is here, and they run out of the yard. I frequently talk and kiss at them when they are sitting on the fence. They seem to like it. Yes, I know that feeling! 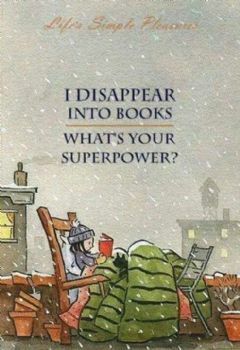 Me too, and a great superpower it is!